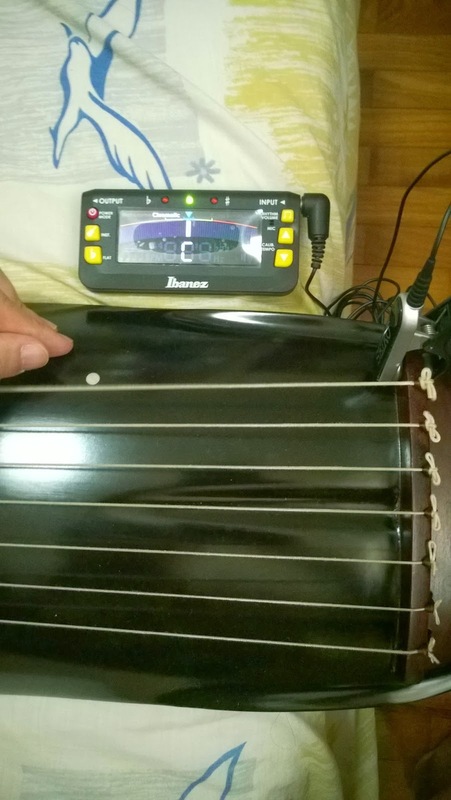 Tuned guqin relative to my thickest 1st silk string at C (440Hz). After all 7 silk strings were tuned, the thinnest 7th silk string was at above C-sharp (almost at D pitch). The gravitas and overall tone color of the silk strings improved IMHO. I also played my guqin on my lap so the vibrations might have contributed to the overall tonal quality too. Haha.. Brand of silk strings was Tobaya, available from their online store at www.tobaya.co.jp Guqin used was banana-leaf shaped made in 2012 by Zhang Yong 张勇 in Sichuan province PRC. Yes, Tobaya guqin silk strings can be tuned relative to C pitch on thickest 1st string without breaking. It also sounds louder and better when silk strings are tuned higher, in my humble opinion, as there seems to be more gravitas (more oomph) in the thicker bass strings. *smile* Of course, as with all things, YMMV. The thickest 1st silk string was tuned to C pitch. 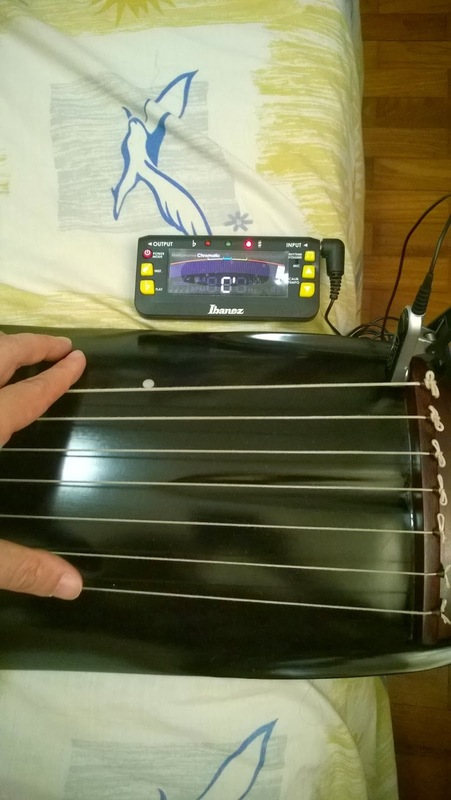 After all the 7 silk strings were tuned relative to the C pitch of the thickest 1st string, I measured the thinnest 7th string and it was sharper than C-sharp, which was almost D pitch. This was very similar to what metal-nylon strings were normal tuned to. This was excellent, because these Tobaya silk strings could actually be tuned to high without any problems. 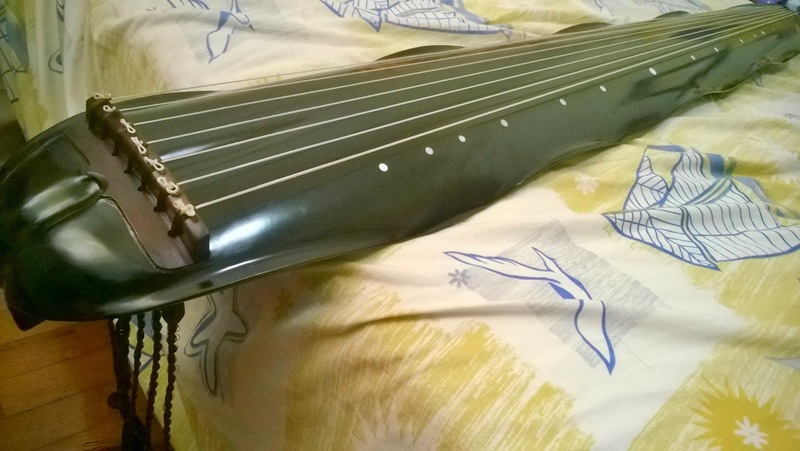 Picture of my guqin with all 7 strings tuned relative to C pitch and ready to be played, with the guqin placed on my lap. 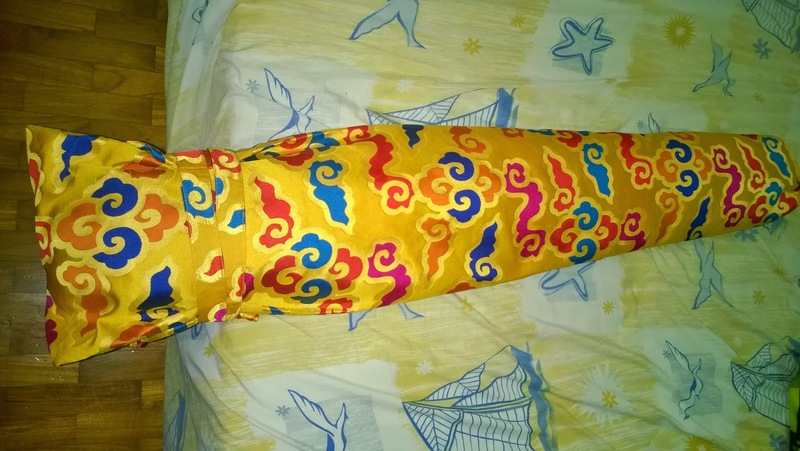 After playing several long tunes 流水 (liu shui)，憶故人 (yi gu ten)，平沙落雁 (ping aha luo yan), I loosened all the 7 silk strings and kept the guqin back into its bag.